A miniature man stands on top of a steam locomotive as it emerges from a dark tunnel and continues its trek high among the Veracruz mountains. With a shovel in hand and a plastic hat on his head, the little man remains frozen, playing his part in a small scene that echoes one of the great periods in Mexican history. The little man is a toy within a bigger toy; one of the figures in a diorama representing the early days of the Metlac Bridge railway, the first railroad to connect Mexico City with the country’s eastern port in Veracruz, back in 1873. 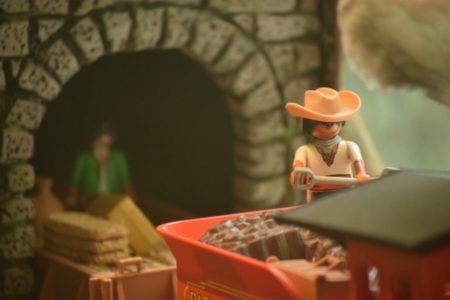 The diorama is one of six that make up Playmohistoria, a Caracol Museum exhibit that represents moments in Mexican and world history using Playmobil figures. A small yet charming exhibit, Playmohistoria shows the didactic potential of toys as tools for portraying history’s broader chapters in a more appealing way. The dioramas, with all of their color and detail, might pick up the interest of those who otherwise would be hesitant of leafing through a dusty, old book. Two of the dioramas represent broad periods of world history (ancient Egypt and the age of vikings) while three depict moments in daily life from specific periods in Mexican history (a market square during Mexico’s colonial age, a pirate raid in the later days of New Spain and the first Mexican railway in the late 1800s). The sixth diorama and center piece of the exhibit, titled “The Tree of Life,” is a replica of what Spanish priests used to illustrate the natural order according to the Catholic tradition. Used back then to educate natives on the Catholic faith, Playmohistoria uses it now to summarize the stages and relevant figures in Mexican history. Details are indeed one of Playmohistoria’s greater appeals. Each diorama seems massive even when considering the small scale of the figures, and all six of them are filled with little, isolated instants that add charm to the overall scene. There’s a mummy being prepared for burial in the ancient Egypt diorama, as well as a depiction of the dead marching towards a scale while flanked by fire and Anubis-headed sentries. There’s family of small dogs standing at the feet of Metlac Bridge and a pair of seagulls fighting over the carcass of a fish in the Viking diorama. There’s also kids playing in the fountain of the New Spain market place diorama, a red-haired monk captive in a Viking vessel that rows towards the sea and a Spanish officer preparing to eat his meal as a battle rages on at the other side of the wall between pirates and the Spanish armada. This isn’t the first time members of Amexplay have worked with museums, according to Montiel León. The association had already done projects for the Mexican Antique Toy Museum, Azcapotzalco’s Culture House, Del Carmen Museum and a host of others. They’ll soon be hosting another exhibit, this time with a Mexican cinema theme, at the Children’s Film Festival in the National Center for the Arts.